A tight game in North Bay on Wednesday night saw the the Ottawa 67’s fall just short, dropping a 4-3 decision to the Battalion despite a hard-fought effort. Quinn Yule, Tye Felhaber and Noel Hoefenmayer were the goal scorers for Ottawa, while Matthew Struthers and David Maeir both struck twice for the Battalion. 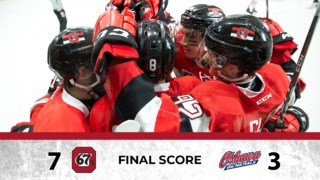 The 67’s got plenty of rubber on net as they outshot their opposition 44-26 but North Bay goalie Christian Propp had a strong showing in turning away 41 shots. 67’s goalie Will Cranley made 22 saves on the night. The two teams combined for three goals in the last two minutes of the first period. Struthers opened the score at 18:43 while Yule answered with a goal only 15 seconds later. Struthers would then score again with only seven seconds left in the period. Maier was the lone scorer in the second period, giving the hosts a two goal lead heading into the third. Tye Felhaber cut the lead to one only 1:50 into the final period on the power play. Ottawa gave it their all in the third, outshooting North Bay 17-4, but it wasn’t enough to tie things up. Maier scored the insurance goal, which turned out to be a crucial one as Hoefenmayer made it a one-goal game with just under two minutes left. 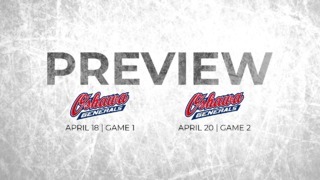 Ottawa will be back in front of their home fans on Saturday, as they host the Barrie Colts with a matinee game at the Arena at TD Place at 2 p.m. 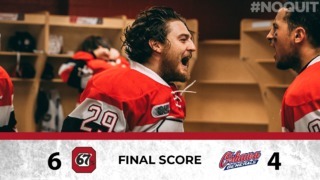 The 67’s will also host the Sault Ste. Marie Greyhounds at 2 p.m. on Sunday, the second game of the upcoming five-game homestand.